If you are short of time, the answers to the following 3 questions should let you know all you need to about the Foreo ISSA 2. If we have missed something, let us know in the comments. If you want more detail, you can read our full Foreo ISSA 2 review further down the page. Just like the ISSA that came before it, there is nothing drastically wrong with this brush. It is a brush focused on design and providing a decent clean to your teeth. It looks different and boasts and incredible battery life. A slight upgrade on the original ISSA, the ISSA 2 does not justify an upgrade unless you need a new brush. Price and function will put some off and whilst technically electric, it feels like somewhat of a crossover between this and a manual brush. ISSA’s design language and approach is quite different to everything else on the market and nothing really competes, aside from the original ISSA by Foreo, which actually is better value for money. Nothing offers the same battery life, but simplicity over features seems to be the message here and with this in mind it will be the Sonicare ProtectiveClean 4100 and the Oral-B Pro 1000 you should consider, but they are still some distance apart. 3. Where is the best place to buy the Foero ISSA 2? The ISSA 2 is not as widely stocked as many would like. It is primarily sold online via Foreo.com you can purchase from the Foreo boutique in Paris if you happen to be there. We’ve also included a price comparison below for retailers that are stocking the ISSA 2. Delivery is free when buying online from Foreo and it can be with you in just a few days. Maybe Foreo (short for ‘For Every One’) is a new brand name to you. It does not resonate as well as the likes of the more household known brands of Braun and Philips, but slowly they are making a name for themselves. A Swedish firm they began trading in 2013 having created a beauty product. Pioneering and innovating, their intention is to bring revolutionary products to market and the all silicone ISSA 2 is the next phase in their oral health range of products. The ISSA 2 is available in a few different variants. The Mint color option that I am reviewing here, is more of a very pale Blue with a slight Green hue to it. To be honest I would be more inclined to call it baby Blue than Mint, which in my mind has more of a Green color associated with it. Aside from color options you then have 2 different box contents options. The first comes with the ISSA 2 brush handle and the standard silicone bristled brush head. The sensitive set includes a Hybrid brush head as well as the silicone brush head, so you have the choice of which you use. This sensitive set is only available in the Mint or Pearl Pink color option. The price is $169 and $189 respectively. Foreo ISSA vs ISSA 2 – What are the differences? The ISSA 2 is the replacement to the original ISSA, but what are the differences between the 2 models? The bullet points below explain how the 2 differ. But, to complicate matters slightly, you need to be aware that there is too a product called the Foreo ISSA Hybrid. This ‘Hybrid’ name refers to the brush head rather than the brush handle. Whereas the ISSA came with an all silicone brush head, the Hybrid comes with a mix of silicone and PBT polymer bristles. As explained in the variants section of this review, the ISSA 2 comes as an option with both of these heads included in the box. The battery life has doubled from 6 months to 12. The number of speed/intensity settings have doubled from 8 to 16. The ISSA 2 comes in Mint, Colbalt Blue, Cool Black and Pearl Pink color options. The Pearl Pink color replaces the Lavender color option from the original ISSA. The ISSA 2 is 10g heavier. The following is a summary of the good and bad points of this brush. Design – Stylish and ergonomic. Different to most toothbrushes. Adjustable intensity – Increase or decrease the motion to your desired level, choose 16 different settings. Battery life – Up to 12 months battery life from one charge. Adjustable intensity – 16 settings are a bit much and no simple way of telling what setting you are on. Travel case – Not quite what you would expect for a brush of this price. Premium is without doubt a word you would use to describe the products Foreo make and the all silicone ISSA 2 feels quality in hand. But the high end experience starts sooner than that with the transparent hard plastic presentation box that it is sold within, no cheap and flimsy cardboard box here. To me it is a similar experience to unboxing an early Apple iPod if you ever got to experience that. A number of the key features of the ISSA 2 are called out on the packaging and you can easily see the brush and the brush heads. I am reviewing the more premium ISSA 2 Sensitive Set in Mint. The sensitive set comes with an additional brush head in the box compared to the standard variant. It costs $20 more as a result, but that additional head is the Hybrid brush head that contains both silicone and polymer bristles. Once you pop open the plastic box you are presented with the brush handle that is pre-fitted with the silicone bristled brush head. There is the spare hybrid brush head, a USB charging cable, a White travel pouch, a Pink scratch pad and a small amount of documentation. The scratch pad, is to my understanding to be used if the silicone on the brush becomes damaged. You rub the pad over the scratch to remove as best as possible the mark and damage that has occured. You will see from the images that the ISSA does not have the typical electric toothbrush look. In my mind although it has an electric motor in it, there is a crossover between manual and electric, particularly given the size of the brush head. If feels like the brush has been through hundreds of design revisions until it was just perfect. The physical shape and size is the same as the original ISSA, if you were wondering. Subject to which variant you opt for you have up to 4 different color choices. They are Mint, Pearl Pink, Cool Black and Colbalt Blue. The option of choice is nice as it is not something you get with a lot of brushes. The more shapely brush handle is not as tall as conventional brushes. The main brush handle houses the battery and the motor. Sort of egg shaped, it is thicker in hand, but the rounded design and soft silicone make for a very comfortable feeling in hand and for some with limited dexterity the shape could be beneficial. I do like the silicone, there is something more warming to it and just feels really nice to hold. Design likely dictates as to why the power button and the intensity setting buttons are almost lost amongst the body. They do not immediately stand out. Minimalism feels like it was a priority on the design brief. This works for and against Foero. On the plus side it looks great and is appealing, on the negative side everyday practicality and ease of use is affected by this in my mind. On the back of the handle, right at the bottom is a very small cover which when opened reveals the proprietary charging connector for this brush. It is a bit fiddly to open, its a small tab, but given you need charge it once a year, this is hardly an issue at all. The base of the handle is a transparent plastic. Inside is a White colored LED that lights up at different times for different reasons. Upon charge or when power is low (very rare) it emits a soft White light which draws your attention. It also remains lit for a full 60 seconds after a 2 minute clean, until the brush automatically powers off at 3 minutes. More explanation on this shortly. As you might expect the brush head is detachable. At the very bottom of the head is a thin, but important metal plate that gives strength to the head, but is branded too. When fitted it places the logo just as the break between handle and brush head. This is yet another smart design element. Just pull the head off and push it on to replace it. The medical grade silicone means this brush head actually needs replacing once every 12 months, unlike more conventional heads that need replacing every 3. The silicone bristles on the standard head are super soft and this is part of the innovation of the ISSA 2. They are designed to be less abrasive on the teeth and gums and therefore be safer and more comfortable for users. Extra soft bristles adorn the outer edges of the brush head with slightly firmer ones in the centre. Thin the bristles are, they are wider and more rectangular in their shape than the normally rounded bristles found on brush heads. Included is the hybrid brush head too. This offers the combination of durable PBT polymer bristles in the centre of the brush head and ultra-soft silicone ones on the outer edge. This means that the bristles are strong on plaque but gentle on gums. The bristles are soft, but the brush head is oversized in my opinion. 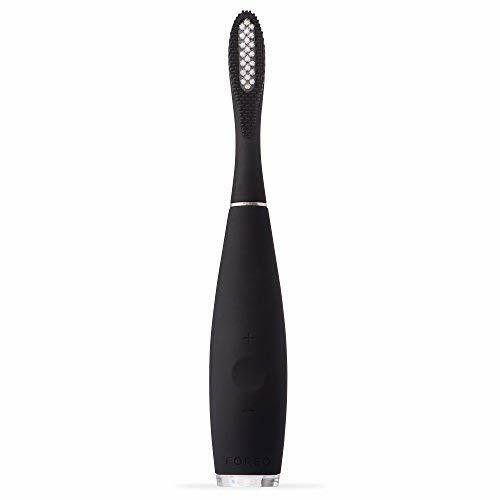 Much larger than a regular manual toothbrush and sort of dwarfs the brush heads you find on an Oral-B electric toothbrush. In part this is because the ISSA is somewhat of a hybrid in that it is an electric toothbrush but it is not packed with lots of the gadgets and gizmos many of today’s electric brushes come with. I use Oral-B brushes on a daily basis and using the FOREO was a little strange. The brush head is really big in my opinion and you have to adjust slightly to get to get to tight sports in the mouth and your back teeth particularly, to feel like you are cleaning them properly. A nice level of flex in the head too means the brush does not feel too rigid in use. The fact that the back of the brush head is coated in silicone it is softer on the cheeks and the ridges on the back actually help clean them too. Using sonic pulse technology, the ISSA 2 delivers 183 high intensity pulsations per second, that just shy of 11,000 per minute. This is not as intense as some of the big brand electric toothbrushes, but still a lot more movements than any human can create in the same time. Use the + and – icon to find an intensity that works for you. You have 16 power settings to choose from. Compared to the original ISSA, that is an extra 8 options to choose from. The brush remembers your preference until you change it. I can’t honestly see the benefit of 16 different settings. 8 was more than enough in my mind. You can detect the subtle power/speed differences, but it can be a bit of a faff to press the + and – buttons to change it. It is a lot of clicks if you want to go from the lowest to the highest setting for example. Whilst not essential, unlike Sonicare brushes that have LED’s to show what intensity setting you are using, there is no such option on the ISSA 2. What this means is that it feels like a lot of work to switch the intensities. Maybe I am being too harsh, but 8 was more than enough for me. After using the brush, a rinse with warm water after use is all that is needed to clean the brush heads off. There is a lack of clinical study and trials into the long term effectiveness of silicone and many dental professionals remain wary. ISSA Hybrid has been trialed under clinical conditions against a traditional manual toothbrush, with a focus on assessing the benefits of silicone in dental devices. To my knowledge trials have not yet compared ISSA 2 to Oral-B’s small round rush head or Sonicares more powerful motor, as such don’t expect your dentist to be raving about the ISSA as many will prefer the more tested Sonicare and Oral-B brands. However, this brush is not setting out to be or replicate quite what they are. It is trying to be different and attract users for more than just a quality clean. Without innovation there cannot be improvement and hats off to Foero for exploiting the beneficial properties of silicone, particularly medical grade silicone. No pressure sensor is built into the brush like you get on many Oral-B models, but you can hear the motor straining if too much pressure is applied when brushing, so you know when to reduce it, if you listen out for the change in sound. A timer is built into the ISSA 2 with the benefit of a quadpacer too. It is activated when the brush is powered on. The job of the pacer and timer is to encourage you to not only brush for the right amount of time but evenly within the mouth too. Dentists recommend brushing twice a day for 2 minutes at a time. At 30 second intervals a pause in the motor and a flash of the light on the bottom of the brush signals it’s time to change quadrant. These 4 are the upper right, upper left, bottom right and bottom left. Whilst some brushes will automatically turn off at the end of 2 minutes, notably Sonicare, the ISSA 2 continues until 3 minutes, for those who want to give an extra bit of attention to their teeth..
At the recommended 2 minutes, the motion of the brush head will pause 3 times and the LED light will flash. It will then remain on until the brush turns off at 3 minutes automatically to reduce the chance of over brushing. You can of course turn it off, by pressing the power button at 2 minutes if you wish. The water resistant brush comes with a travel pouch. The White leather pouch is stitched on the base and side, leaving access only from the top. Just slide the brush in and out of the pouch. Not sure whether they expect the brush head to remain fitted, but the case is fractionally too small in my honest opinion, the top of the head pokes out ever so slightly. Perhaps this is intentional to make it easier to remove. The ISSA 2 has the ability to lock the brush, meaning the brush can’t be accidently activated. However, with ISSA 2 there is a reduced number of bristles. A good rinse and any lingering nasties are washed away. Foreo do recommend spraying the device with their Silicone Cleaning Spray and rinsing with warm water afterwards and then allowing to air-dry for optimal results. Essentially an anti-bacterial spray it’s worth investing in for added peace of mind and protecting the longevity of your brush. The functions of this brush are relatively basic but the refreshingly simple approach, stylish design and everyday use feels very compelling. Just one cleaning mode is available on this brush. Unlike others that offer sensitive, whitening, gum modes and more, you gain the extra level of control and flexibility in through the 16 different intensity settings. Bluetooth connectivity or a smart toothbrush is desirable for some, but not all, so if this is something you want you will need to look elsewhere. I usually find myself frustrated by products that appear excessively expensive given what they offer, but the Foreo is somehow different. It feels complete and justifiable. I have set a personal benchmark as 2 weeks battery life being the minimum that is really desirable from an electric toothbrush. Most, but not all achieve this. I like the idea of going away and not having to worry about the charger. This is not an issue at all here. In fact I could go away for months! Yes months! 365 days of battery life is possible from this brush according to Foreo. That is a whopping 730 brushing sessions, 1460 minutes of runtime! How is that possible, a whole year from a brush this size?! I find it incredible. Now as best as possible I like to test the batteries to their fullest and confirm or deny the actual running time. But as you can probably appreciate I am going to have to take Foreo’s word on this one. Oh and it charges in just 1 hour. This is perhaps a slight annoyance. Whilst it is so rare you need to charge it, the way you do it, is by lifting a cover on the back of the brush and inserting the proprietary connector. The cover can be a bit fiddly to replace after charging. Whilst this is a great selling feature and I have never come across a brush with such a great battery life, I have to question why. The original ISSA had 6 months and that was impressive. Did the battery life really need to double to 12? With such a rapid charging time too I don’t think anyone would have minded if this brush needed charging even once a month. There isn’t an obvious icon here on the ISSA 2, but the trend is to do things differently and that they have. The base of the ISSA 2 emits a white flashing light when battery is low. If depleted entirely the motor will stop. We included a live price comparison of retailers selling the ISSA 2 here. A quality, well designed product is rarely cheap. A good, middle of the road electric toothbrush is generally anywhere between $40-100. The ISSA 2 starts at $169 or is $189 for the sensitive set, that includes the hybrid brush head. Now as electric toothbrushes go, this is fairly pricey. Honestly speaking, there are better options available in our recommended list of brushes for 2019. Oral-B’s flagship Genius Pro 8000 sells on average for $160, but is loaded with features. It does not boast the battery life of the ISSA 2 though. Where normally you need replace brush heads every 3 months, the ISSA requires replacement every 12. This might suggest a cost saving on the head, but the one head is more expensive at $20 each. Let’s work out the cost over a 3 year period with the cheaper ISSA 2. Based on one user, the cost will be $209 ($169+ $20 + $20) or 19 cents per day. This is far from the most expensive brush when you break it down, but it is more expensive than the ‘average’ brush. Then again this is not ‘average’. You are paying for the innovation, the design and the uniqueness of this product and how exactly do you quantify this? I do however think this is harder to justify with the ISSA 2 than it was with the original ISSA as all brands are stepping up their game. Yes, the ISSA 2 comes with a better battery life and more cleaning intensities, but it wasn’t exactly lacking beforehand. A price drop, rather than investment in new features would have been my preference. If design and aesthetics are important the ISSA 2 has it. And whilst not cheap Foero are not in the business of big discounts or price promotions like other brands can be. Thus you are not being cheated into paying full price as it will rarely be discounted. Completely water resistant, the weakness could be the cover over the charging port. Over time it could weaken but it is opened so infrequently this is unlikely to happen given the lack of need to open the cover all that often. It is solid, well built and is by no means rushed off the production line. The brush comes with a 2 year warranty as standard, so should something go wrong it can be dealt with by Foreo in that time. What is interesting and not all that well publicised is the quality guarantee Foero offer. It is a 10 year guarantee that you can make use of just once, but is applicable to up to 5 items in a single order from foreo.com. How it works is that if a defect occurs with your Foero product after the initial 24-month period, but within the 10-Year Quality Guarantee time frame, subject to first obtaining pre-authorization you can get 50% off a new product. This also applies if a defect occurs with your Foreo product during the initial 24-month period, but was not purchased from foreo.com and you are unable to provide the original purchase receipt for any reason. For me this shows a real sign of commitment and quality in the product and a focus on providing customer satisfaction. You can find out more here. My concluding thoughts and feelings of the ISSA 2 are much the same as the original ISSA/ISSA Hybrid that I reviewed last year. From looking purely at the features from the press release and sales pages I would struggle to justify the price tag — you may be better off looking at some of our other recommendations here. Having unboxed, held and used it I can’t say that it certainly exceeds what I had expected of it, but the price is a bit of a stretch. The silicone bristles are soft on the teeth and gums and for some may well offer a more comfortable brushing experience. It is most certainly not for everyone. If you want a more conventional electric toothbrush, in which case, the Sonicare ProtectiveClean 4100 is the best to go for. If you crave fashion, like the finer things in life and appreciate style, detail and quality then the ISSA 2 might just be for you. There is no denying that this brush is fantastic to hold and touch, the battery life is great too and the clean is not all that bad. I scored the ISSA 4/5 last year. The ISSA 2 drops to 3/5. The extra 6 months battery life and a further 8 intensity whilst potentially beneficial, were not exactly needed and as other manufacturers up their game, I am not sure Foreo are doing so at the same rate. I would have preferred a better travel case, a couple of extra brush heads or some other feature added. Or perhaps a slight reduction in the price. The ISSA 2 features ultra-soft, hygienic bristles that gently hug gums while effectively removing plaque. Its 16 adjustable speeds give you full control, and 2X the sonic power ensure a whole-mouth clean and lasting freshness. Apply your regular toothpaste to the brush head, turn ISSA 2 on, brush and rinse. Is the Foreo ISSA 2 an oscillating brush? Does the Foreo ISSA have a pressure sensor? Does the Foreo ISSA 2 have Bluetooth? Does the Foreo ISSA come with a warranty & how long is it? The Foreo 2 comes with a 2 year warranty. Does the Foreo ISSA 2 have a built in timer? The battery lasts up to 365 days. That is a whole year or 1460 minutes of usage time, if used twice a day for 2 minutes. Can I use the Foreo ISSA 2 in the shower? Sort of. It is a sleeve rather than a hard plastic travel case that most of us expect. You slide the brush into the pouch. Do you own or have you used the Foreo ISSA 2? The Foreo ISSA 2 brush spoken about in this review was provided by Foreo PR department. Electric Teeth did not purchase this model. No financial reward was provided to conclude the review the way that we did. Any updates on reliability, durability, and performance (any noticable improvements in health of gums and teeth)? Any complaints that the larger size makes it difficult to properly clean the entire mouth especially the back of the teeth? Finally, amazon reviews question its construction quality ( breaks easily or stops working quickly) and complain foreo customer service is unresponsive and unreliable. Hey, thanks for the comment and question. Given the number of brushes that I test, it is not possible to continue to test all models for an extended period of time and speak first hand what they are like after several months of use. Therefore I cannot speak honestly about the oral hygiene improvements as a result of using this brush for more than the few weeks I tested it for. The larger size of the head in my opinion does make it more difficult to clean the back teeth and truthfully I think there are much better value options that exist, although they are not silicone brushes. We have had a couple of readers comment on the quality and reliability, but this has been in relation to the original ISSA, not ISSA 2. It would be a little unfair to assume that these issues will manifest into the ISSA 2. However, given the very similar design and materials then it is fair to question this issue. All I can say is that in the weeks I tested it, all was ok.
Support does appear to be an issue for Foreo from what I have heard. These issues seem to exist with email communication and as far as I am aware have been resolved by calling the company directly.